The Department of Hawaiian Home Lands (DHHL) has initiated two separate projects to rehabilitate and replace certain sewer lines and install rockfall mitigation/slope stabilization measures in the local areas shown on the attached location map (see the reverse side). 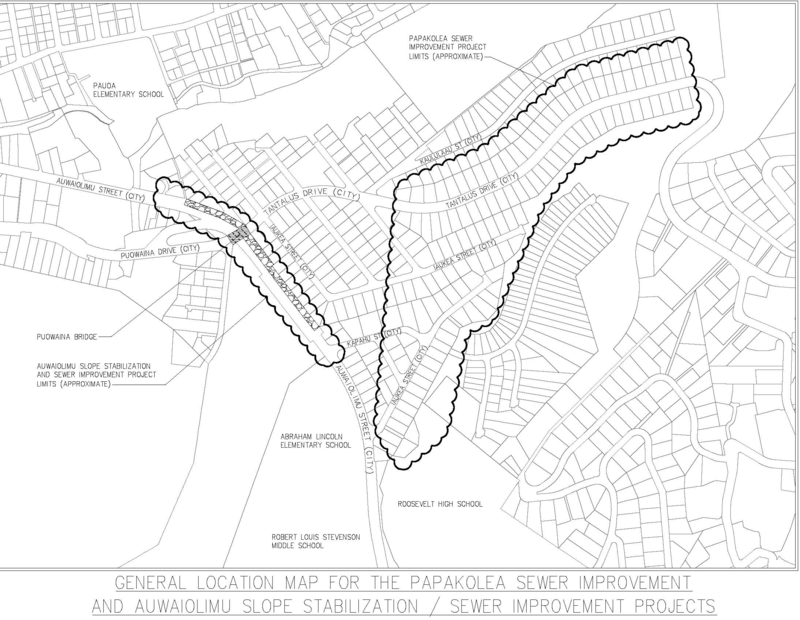 Mira Image Construction (MIC) will be the Contractor for the Papakolea Sewer Improvements Project, and Prometheus Construction (PC) will be the Contractor for the Auwaiolimu Slope Stabilization & Sewer Line Improvements Project. The Limtiaco Consulting Group (TLCG) will be the Construction Management firm for both projects. Both projects are tentatively scheduled to begin in early 2018 and last through the end of 2019. The purpose of the Papakolea Sewer Improvements Project is to rehabilitate and replace the aging sewer infrastructure. As the infrastructure ages it becomes susceptible to cracks, root intrusions, and other defects that can diminish the effectiveness of the pipe lines. In order to maintain an effective sewer system, DHHL has set forth a sewer line rehabilitation/replacement program. The purpose of the Auwaiolimu Slope Stabilization & Sewer Line Improvements Project is to mitigate the natural erosion of the landscape and protect public safety. As the natural elements slowly erode the embankment, sedimentary matter is likely to be deposited into the roadway. In order to mitigate this occurrence, netting will be installed along the slope to reduce falling debris. Sewer line improvements will also be completed as part of this project. The work will affect pedestrian and vehicular traffic along Auwaiolimu Street and throughout the Papakolea Subdivision. We understand that this may be an inconvenience, and we hope to work together with you for the long-term improvement of our community. Homeowners will be notified in advance if sewer service will be limited. If you have any questions or concerns regarding this notice, please call Mitchell Kawamura of DHHL at 620-9278 or Eric Arakawa/Paul Shupak of The Limtiaco Consulting Group at 596-7790.